c) G4 Power Mac owners wanting a PCI-X Serial ATA host adapter with 2 internal and 2 external ports that's backwards compatible with 33MHz and 66MHz PCI slots and supports both OS 9 and OS X. These same owners may want to move this card to their future G5 Power Mac without losing bandwidth. At this time, FirmTek's SeriTek line of Serial ATA host adapters are the only SATA host adapters that allow you to boot OS 9 or OS X from a drive connected to them. If that's your thing, then the SeriTek/1VE2+2 is one of the host adapters you'll want to consider -- especially since its "turbo boot" feature will start up your system as fast or faster than any built-in interface. Keep in mind that it supports both OS 9 and all versions of OS X from 10.1.5 to current. No other PCI-X Serial ATA host adapter supports both booting and both versions of Mac OS except, of course, the other SeriTek cards from FirmTek. 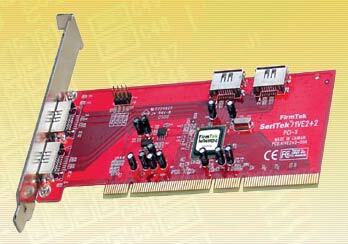 Firmtek was the first company to offer hot-swap on the Serial ATA host adapters. Other companies have since added the hot-swap feature, but FirmTek's implementation is much more "intelligent." The SeriTek's dialog messages report to you the model number, serial number, firmware version, and port number of each drive as it mounts. That has helped me on many occasions to troubleshoot a missing drive or non-mounting drive due to a loose connector, defective drive, or some other reason (like forgetting to power up the enclosure). Some readers have asked me to point them to products for their G4 Power Mac that will not only be compatible with the G5 Power Mac they plan to buy eventually and that take full advantage of the G5's speed. The SeriTek/1VE2+2 is one such product. It is compatible with slower 32/64bit 33MHz and 66Mhz slots featured in G4 Power Macs (and some G5 Power Macs) yet is also designed to run on PCI-X 100/133MHz slots of the high end G5 Power Macs. FirmTek's SeriTek/1EN2 Dual-Bay Hot-Swap enclosure with removable trays is unique among SATA enclosures in that you plug the drive directly into the backplane. Other enclosures may appear to plug drives into the backplane, but they ALL actually have an internal cable running from the drive to the back of the box. That opens to door to signal loss and doubles the chance of loose connections. The 1EN2 has the smallest footprint of any enclosure we've tested. Its low RPM (quiet) fan draws air across the drives, keeping them well below drive manufacturers' maximum recommended operating temperatures. We set up three drive configurations typical of 4 port SATA host adapter users: single drive, dual drive RAID 0, and quad drive RAID 0. We ran those setups on both a G5/2.5GHz Power Mac (133Mhz PCI-X slot 4) and a G4/1.42GHz Power Mac (33MHz PCI slot). The G4 surprised us with faster READ speeds than the G5 but, as you can see, the G4's PCI bus speed limits the write speed of the 4 drive RAID. The Finder Duplicate forces simultaneous read and write to the same volume. The 4 drive RAID of the G5 excels here. None of the configurations could play our uncompressed 10 bit 1350x1080 HD video in real time. The G4 surprised us again with a playback (aka READ) speed faster than the G5. The above two graphs are from our "forced scratch" test with Photoshop CS. We give it about 100MB of memory cache, designate the test volume as scratch disk, open the 300MB file, and rotate it 30 degrees. This makes the test volume go crazy, of course, since the test file is bigger than the memory cache. Our data shows the SeriTek/1VE2+2 to be every bit as fast as the 1VE4 and 1V4 we tested in earlier articles if you plan to use it to create a two or four RAID 0 set in your Power Mac. It should be a popular choice among consumers who only need a maximum of 4 Serial ATA ports, desire a mix of internal and external ports, like the security of intelligent hot-swap, and prefer the option to be able to boot from one or more of the 4 ports. In 5 out of 8 tests, the SeriTek/1VE2+2 installed in the G4 Power Mac running a 4 drive RAID 0 set was equal to or faster than when it was installed in the G5 Power Mac. That's amazing when you consider that the G4 Power Mac has 33Mhz PCI slots while the G5 Power Mac was using the SeriTek in the 133MHz PCI-X slot (slot 4). The G4 Power Mac's "Achilles heel" is the write speed, especially with 4 or more drives in a striped array. The same is true for a G5 Power Macs with 33Mhz PCI slots -- the models with only 4 memory slots. Of course, there was very little difference when running single drives on the G4 Power Mac versus the G5 Power Mac with the exception of the QuickTime Playback test, which the G4, again, surprisingly did faster. Of course, slot 4 is preferred over slots 2 or 3, if it's available. If the SeriTek/1VE2+2 (or any PCI-X SATA host adapter) is installed in slot 3 with slot 2 empty or containing another PCI-X card, you should not suffer any performance loss. BUT, if the 1VE2+2 (or any PCI-X SATA host adapter) is installed in slot 3 with a 32 bit PCI card installed slot 2 (like a FireWire 800 adapter), you will see a drop in sustained write speed --- a big drop. In our 2 drive RAID, we saw the sustained WRITE speed drop from 150 to 38MB/s by moving from slot 4 to slot 3. Reason? Slot 2 and 3 share the same PCI-X bus which drops down to 33MHz when "plain" PCI cards are present in one of the two slots. We've wriiten in the past about the inability of SeriTek PCI-X host adapters to "talk" to certain Hitachi hard drives that have Spread Spectrum Clocking (SSC) "hard wired" in the "on" mode. If you happen to have the "wrong" model of Hitachi drive, you can't run your it on the SeriTek/1VE2+2 (or any other FirmTek PCI-X host adapter). This is not a FirmTek shortcoming so much as a shortcoming of the Intel ASIC, which is also used on some popular Windows PC SATA host adapters. Hitachi, realizing this, quickly released variations of their SATA drives with SSC turned OFF or set to "auto detect." All models of Seagate Barracuda 7200.8, Maxtor MaXLine III, and Maxtor DiamondMax 10 work fine with the SeriTek. The Western Digital 10K Raptors required a simple jumper change to disable SSC. BareFeats' Reveals the "Fastest 7200RPM Drive for the G5 Power Mac"